Today I had some time left and the choice was between staying at home and throwing out the endfed and making a lot of contacts in digital modes or going out and trying a nearby park and making a lot less contacts but learning about my options there. I chose the latter one: I loaded my gear in the bicycle trailer and cycled to a nearby park, just outside the city limits of Utrecht. 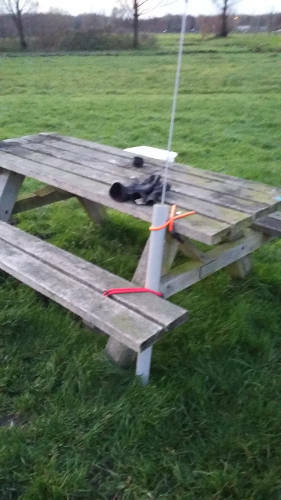 I took the fiber mast and used two elastic straps to tie it to a parkbench. The effect was that the mast was slanted but using it with the wire of the endfed twisted around it the fiber mast stayed up fine without needing its guy wires. And I forgot to bring the tent pegs anyway so I was unable to guy the mast. I tried the endfed as a vertical with some slack at the bottom and the transformer at the bottom. This gave me a horrible standing wave ratio on 40 and 20 meters. I guess the endfed is only balanced when it is stretched. The quick fix was to add a common-mode choke in the coax to the radio. I also added a counterpoise wire to the earth of the endfed to be somewhat balanced again. On the 40 meter band reception was ok but I could not understand a lot of stations. On the 20 meter band there was local interference. In the end I logged one whole contact on the 40 meter band with an Italian special event station. He gave me a 4-4 report and I gave him a 5-9+. After a few tries I gave up making him log me as /portable so I logged it in my PE4KH log. The location is still within JO22NC so I logged in my home log. As soon as the sun set it started cooling down and the grass got wet and I went home. It's a nice location and quite reachable from home. It's 10 minutes cycling and in 10 minutes I had the mast and the radio set up. This page generated in 0.003896 seconds.